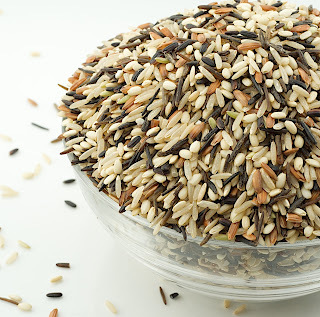 Do you ever struggle with cooking wild rice? I do. Especially the brand I get at Costco. Every time I make it, it either turns out too soggy or half-way cooked. What's the deal?? This is very frustrating, especially for an Asian! My sister has also experienced the same problem, and the same frustration. After years (literally years) of experimenting, she came up with the PERFECT wild rice! I made it last night, and it really does turn out beautifully. Here's your wild rice solution so give it a go, and try the stuffed zucchini boats I'm posting next! 2. Combine all ingredients. Give it a little stir to melt butter and incorporate chicken base. 3. Cover tight (this is important!) with aluminum foil. Bake for 75 minutes. So I just met your sister at Costco while she was buying wild rice. She told me about this recipe and where to find it on your blog! I bought wild rice too and am so excited to try it!